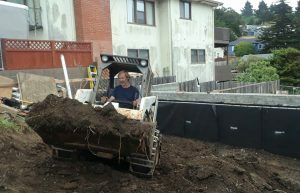 This week our dear friend Jean asked for an update on our construction. Have there really been no blogs since the one on heat pumps a couple of weeks ago??? Sadly, no; not because nothing is happening, but because so much is happening quickly and we’ve needed to make many time critical decisions. Our heads are spinning! The heavy dashed line represents natural grade. Meanwhile, as it’s so much easier to do the work in the crawlspace while the framing is exposed before they put down the plywood subfloor, our talented plumber, Wes Parks, put in his piping for the sewer and water, the graywater system to collect water from sinks and showers for use in the garden, and all the downstairs fixtures for two bathrooms, a kitchen and a laundry. That meant deciding on toilets, a bathtub and a shower pan, and a quick trip to a plumbing supply store (Thanks Vincent Luu at Plumbing ‘n Things!). Whew! Bob also did the first bit of blood and sweat inducing owner-builder work last weekend putting in a fan in the crawlspace. As the soil is high on two sides of the house, mechanical ventilation of the crawlspace was required to meet code, and as our mechanical subcontractor is coming from the east bay and his work will not happen until July… Bob’s next project will happen Tuesday afternoon, placing the stainless bolts in the curved formwork for the entry walk, that eventually will secure our handrails. Insulation in the first floor concrete slab also goes in this week (not usually done in a warm California climate, but a critical part of the Passive House standards of completely insulating and sealing the “envelope” of the building to minimize heating and cooling needs and energy use). As it is a bit unusual, that material turned out to be very hard to find. After getting the run around from Home Depot as it showed as in stock and on sale on their website, but neither of those things turned out to be true (curses! ), we looked as far away way as Sacramento, trying to figure out the volume and how many trips we would need to make with our old beat up Volvo to pick up 400 s.f. worth of Rockwool. Other local stores said the lead time was 6 weeks, which would have delayed the project and was not acceptable. Finally, I tried my new favorite construction material store, where we will be buying all our lumber, doors, decking, etc., and low and behold my new best friend Anthony at Golden State Lumber could order it and get it onsite for me in three days! Thank you Anthony! Whew, crisis averted. 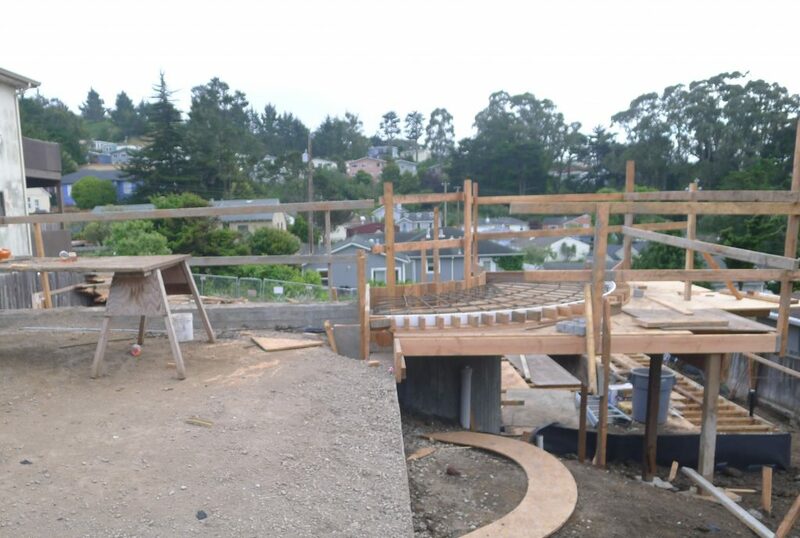 Concrete pour for the cantilevered curved entry walk is scheduled for next Friday, along with site concrete slabs for the exterior stairs and rainwater storage tanks, and a “rat slab” under the crawlspace to keep out, you guessed it, rats! This will be your view as your come to visit us. 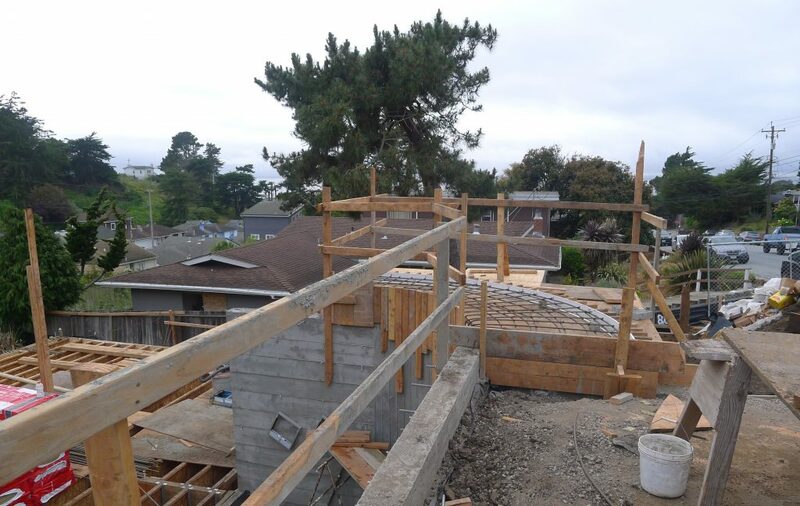 As we get ready for major framing of the walls, floor and roof, we need to finalize our decisions on exterior doors and windows, our floor finish as it related to the stair construction and plumbing, and our solar system design so the structural supports can be in place. We’ve started working on interior elevations, cabinetry, tile, all to stay ahead of the framers and define any niches and non-structural architectural embellishments in the walls and ceilings. Whew! We are thankful for this long weekend! Ok, this is a bit off topic but we are dying to know, how are you dealing with Low-E windows in a passive house? This has been something we have puzzled about for year. Feel free to either reply via email or post the answer down the road when it is topical. What ever is easier for you two. We know you are really busy right now!!! Well hello Barbara and Gregory! It’s been a while! Did you end up doing your project in Brisbane? Good question about windows and not at all off topic! We’re finalizing our window order in a few weeks and I’ll get back to you with more technical information. There is a difference between passive house design and the Passive House program (I know the names are confusing…). The Passive House program includes passive house design as a component of the modeling, but it is more of a whole building envelope approach. Not yet, still working on it. We finally have the land we wanted. As you know these things are a epic journey, much of which feels like swimming up stream. I know about Passive House, I guess I dont know much about passive house design except for my assumption that it would include a solar gain component which is hard to do with mandated low-e windows. This is an issue we will hope to confront some day and wondered what your solution is.